1) As you wrap your gifts this festive season, we want you to document your process. Although that sounds very complicated, it is really simple. take 3 images while wrapping. 2) Once you have these 3 images simply combine them using softwares like MS Paint/ Adobe Photoshop/ online photo editors like pixlr.com etc. 3) Now upload this 1 image as your ENTRY. You can upload as many entries as you like, but make sure each of them are different. 4) Don't forget to caption your image to convey your thoughts. Send in your entry with your contact details and get your friends and family to start voting. The more the votes, the better your chances of winning. “Wrap to Win” is an online gift wrapping Contest that plays on the ideas of creative and innovative minds and on the techniques of wrapping a gift. The Contest is hosted by India Art n Design.com a unit of Pink Daffodils, here and after referred to as ‘IAnD’ and the gift is sponsored by Pepperfry.com, a subsidiary of M/s Trendsutra Platform Services Pvt. Ltd, here and after referred to as ‘PF’ on set Terms & Conditions. Prior to the participation in this contest, it’s advisable for you to take a couple of minutes to read and ensure that you are completely aware of the Terms & Conditions. 1. By clicking ‘submit’, the participant confirms that he/ she is the owner of all intellectual property rights for the content submitted and that IAnD is free to publish that content. 2. Please note that not all submitted Entries will be published on the IAnD website, and due to the large volume of submissions, we will not be able to respond to everyone individually. All updates regarding the Contest can be accessed on IAnD FB Page. 3. IAnD will also regularly publish submissions on social networking sites and elsewhere on the web. The participant will then upload these pictures in JPEG, GIF images format. The participant has now entered the Contest. b) The participant can then share their entries with his/her friends & family members to get maximum votes for his/her entry. The votes will be through the voting page of the Contest. This may be one of the deciding aspects for declaring the winner. More the votes, more it will increase your chance to win. c) Any person interested in participating in the Contest need only submit his/her email address through the Contest application along with the images and a caption. Incomplete entries will not be processed. 4. Results will be announced online on 30th October. · Mr. Ashley Rebello - Celebrity fashion designer,. 1. Material: Use of material is yet another important aspect of wrapping. The participant has full creative freedom to make the wrapping interesting and out-of-the-box. 3. Presentation: It is the overall presentation of the gift, which makes it unique. Because, remember it’s the first impression that can either make it or break it. The Contest is open to residents of India only. This Contest is strictly governed by the laws of India including the Privacy Laws of India. Contest participants must have attained the age of 18 years to participate in the Contest. Employees, agents and promoters (including their immediate family members) of IAnD and PF - and any of their divisions, affiliates and subsidiaries, freelancers and others associated with the Contest in any manner, are not eligible to participate in the Contest. 1) The Contest Winner(s) shall be eligible to win the Contest Prize as decided by IAnD at IAnD’s sole discretion. Any and all taxes and/or levies applicable under the laws of India shall be borne by the Contest Winner in relation to the Contest Prize. 2) Incomplete, erroneous and/or submission of answers/response submitted after the Contest Period shall not be considered and shall be null and void. 3) IAnD shall not be responsible for any technical disruption and/or failure/ server problems and/ or any other difficulties of such nature, due to which the participant is unable to participate in the Contest. 4) IAnD reserves the right to disqualify any or all participants from participating in the Contest without assigning any reason. The decision of IAnD in this regard shall be final and binding upon all the participants. No queries or claims in this regard will be entertained at any stage of the Contest. b) The participants shall indemnify IAnD and PF, its officials, employees, representatives against any claim, loss, damages and liability arising as a result of infringement of third party intellectual property rights. d) The entry does not contain software viruses or any other computer code, files or programs designed to interrupt, destroy or limit the functionality of any computer resource. f) In the event of any discrepancy as to the date and/or the time of receipt of any entry, IAnD shall have the final decision in resolving such discrepancy. g) The Contest is subject to force majeure conditions. h) IAnD reserves the right to amend these rules at any time at its sole and absolute discretion. The mode of delivery/obtaining the Contest Prize shall be communicated by IAnD to Contest Winner upon completion of the Contest Period at IAnD’s sole discretion. The Contest Prize and related services shall be held at such venue and time, and of such class and/or value as may be decided by IAnD at its sole discretion. The Contest Winner shall collect the Contest Prize upon showing and confirming the Contest Winner’s name, mobile number, email address and photo ID proof. Failing to collect the Contest Prize or in the event, not presenting necessary proof of participation and identity to the satisfaction of IAnD, Prize Winner shall be disqualified from collecting the Contest Prize and IAnD may, at its discretion, select other Contest Winner. In case of Contest Winners beyond the local area of Mumbai, will have to travel to such venue as decided by IAnD on their own expense. IAnD shall not be liable to refund any travelling/accommodation and/or food expense to such Contest Winners. 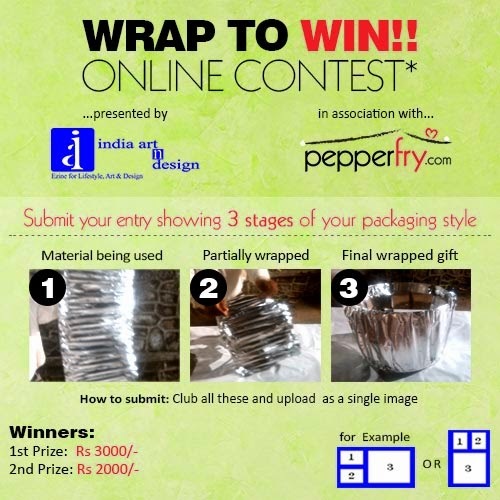 The Contest Prize will be given in form a ‘coupon code’ that can be redeemed from the Sponsor – pepperfry.com online. All conditions and shipping policies etc from Pepperfry.com apply. 4. If IAnD is unable to establish successful contact with the Contest Winner (i.e. in case the Contest Winner does not provide necessary contact details as mentioned above for establishing contact), that Contest Winner shall not be considered for the Contest Prize and IAnD may choose any other Contest Winner at its sole discretion. 5. IAnD shall not be liable for any defect in the Contest Prize and makes no representation and/or warranty regarding the same and hereby expressly disclaims all other warranties, express or implied including but not limited to any implied warranty or merchantability or fitness of the Contest Prize. The “Wrap to Win Contest” is sponsored by Pepperfry.com, a subsidiary of M/s Trendsutra Platform Services Pvt. Ltd. This Contest is governed by these official rules (“Official Rules”). By participating in the Contest, each entrant agrees to abide by these Official Rules, including all eligibility requirements, and understands that the results of the Contest, as determined by IAnD, are final in all respects. The Contest is subject to all federal, state and local laws and regulations and is void where prohibited by law. * This promotion is in no way sponsored, endorsed or administered by, or associated with, Facebook. Any questions, comments or complaints regarding the promotion will be directed to IAnD, not Facebook.